DUBLIN - Ireland dispatched its armed forces to bolster flood defences on Sunday and warned people against non-essential travel as the remnants of Hurricane Ophelia threatened the country with its worst storm in 50 years. Hurricane force winds are likely off Ireland’s south coast but they are expected to ease before they reach the coastline, said the weather service, which has declared a Status Red weather alert. The weather service has warned some gusts may exceed 130 kilometres per hour (80 miles per hour). The government has also warned of localised coastal flooding and likely disruption to transport and electricity services. “You should not be out in this storm ... this is an extreme weather event,” the chairman of Ireland’s National Emergency Coordination Group Sean Hogan said at a briefing. Asked if it was likely to be the worst storm in half a century, he said the “comparable weather event” was Hurricane Debbie, which killed 12 in Ireland in 1961. Ophelia has the potential to be a life-threatening event in Ireland, he said. The storm is likely to pass close to a west of Ireland golf course owned by U.S. President-elect Donald Trump, who has been planning a wall to protect its greens from coastal erosion. 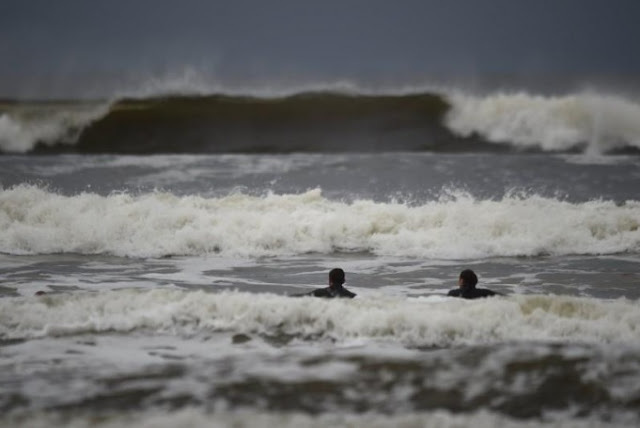 The storm has the potential to reshape stretches of the Irish coast, John Sweeney, a climatologist at Maynooth University,” said. “It is going to be perhaps an event comparable to Debbie in 1961 which has effectively marked many of the coastlines of the west coast of Ireland to the present day,” Sweeney told state broadcaster RTE. Members of the armed forces have been sent to Tralee on the south west coast to build coastal defences with sandbags. Britain’s meteorological service said in a statement that the weather system may effect road, rail, air and ferry services. British media are comparing the storm to the Great Storm of 1987, which subjected parts of the United Kingdom to hurricane strength winds 30 years ago to the day. Ireland dispatched its armed forces to bolster flood defences on Sunday and warned people against non-essential travel as the remnants of Hurricane Ophelia threatened the country with its worst storm in 50 years.